Latest i﻿mages snapped by NASA’s New Horizons spacecraft reveal the contours of ‘Ultima Thule’ — the space rock 2014 MU69. NASA’s New Horizons spacecraft zipped past the space rock 2014 MU69 on 1 January — making the rock, nearly 6.5 billion kilometres from Earth, the most distant object ever visited. Images taken before the spacecraft’s closest approach at 12:33 a.m. US Eastern time show an elongated blob that resembles a spinning bowling pin. MU69 is roughly 32 kilometres long and 16 kilometres wide. 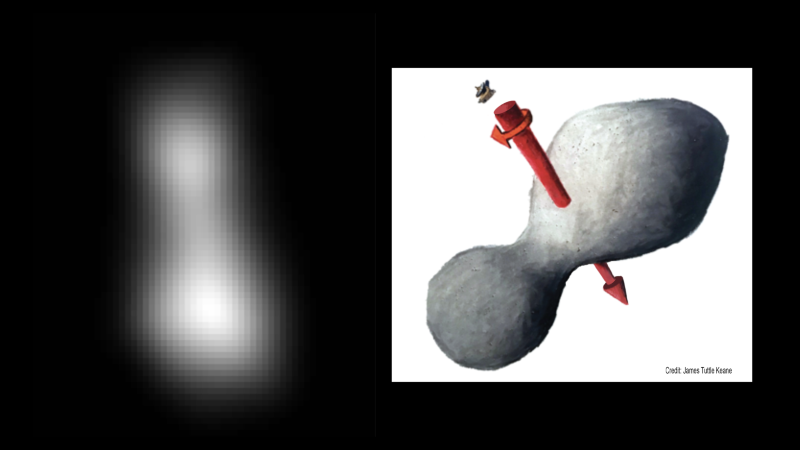 The two lobes shown in the images could represent a peanut-shaped object or two smaller objects orbiting one another. The rock appears to be spinning almost directly face on to Earth, either once every 15 hours or once every 30 hours. “It’s almost like a propeller blade,” said team member Hal Weaver, ﻿a planetary scientist with the Johns Hopkins University Applied Physics Laboratory in Laurel, Maryland, where mission control is based. The New Horizons spacecraft is now sending bursts of data and photographs back to Earth. The probe is safe and seems to have gathered all the data it was expected to as it whizzed 3,500 kilometres above the surface of MU69. Mission scientists plan to release higher-resolution images on 2 January. “We’re going to start writing our first scientific paper next week,” said Alan Stern, a planetary scientist at the Southwest Research Institute in Boulder, Colorado, and the mission’s principal investigator. New Horizons flew by Pluto ﻿in July 2015. Its visit to MU69 is the first to explore an object from the ‘cold classical Kuiper belt’, a collection of distant space rocks that have been essentially undisturbed since the Solar System formed more than 4.5 billion years ago. They lie beyond Pluto’s orbit and represent some of the most primordial material in the Solar System. “This could very well be the pristine sample we’ve been waiting for,” says Hammel.